Funded by Youth Music, Sound Connections’ Innovate programme strives to enable emerging practitioners and smaller organisations to create new musical approaches and ideas for working with disadvantaged young people. 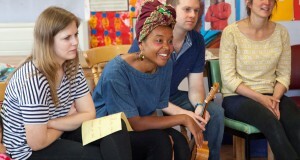 Our 2015-16 cohort of Innovate projects; Hoxton Rhymes (Rosie Adediran), Cardboard Citizens, London Symphony Orchestra, Hear my Voice (Olivia McLennan) & Sing Out (London Gay Men’s Chorus) worked closely with Sound Connections to develop unique models of working that demonstrated trail-blazing, innovative practice. You can read about each project’s case study report on the Sound Connections Resource pages. Hoxton Rhymes provided a springboard for Mums and very young children in Hackney to experience creative music making in a meaningful, bonding way. The results of the project was an interactive app to support the participant’s ongoing engagement with musical play called Hoxton Rhymes. In Autumn 2015, Cardboard Citizens presented The Music Lab; an open space for young people, aged 16-25, to creatively express themselves and try out new things in a safe environment. Over a 12 week programme of workshops, the Music Lab engaged 31 young people from hostels, youth centres and youth provisions. Led by London Symphony Orchestra, Bexley North Borough Orchestra was a brand-new children’s orchestra for young musicians in Thamesmead and Erith, Bexley. Delivered in partnership with Bird College, the Bexley North Borough Orchestra was created to provide children aged 9-10, with a progression route to continue their musical development following the borough’s provision of First Access whole-class instrumental tuition for all Year 4 pupils. Hear My Voice was a unique intergenerational music project, taking place in Northumberland Heath, Bexley. Involving children in the Early Years (under 5s) and their parents, and older people living in the area, the project offered participants the opportunity to exchange and share shared musical experience across generations, fostered local community relations and promoted cohesion within Northumberland Heath. Sing Out (London Gay Men’s Chorus) – worked with young people aged 13-19, using song-writing to explore issues faced by young LBGT people and empower them to express themselves creatively, improving their musicianship and well-being.